Reducing the number of infective disease pathogens in turf surfaces now could help achieve better long-term control of damaging attacks over the winter. Syngenta Technical Manager, Dr Simon Watson, warned Microdochium (Fusarium) Patch spores are ever present in thatch, turf base and on leaf surfaces. "Problems arise when conditions are favourable to spore germination - when the build-up of pathogen numbers overwhelms the turf plants' natural defence mechanisms and damaging flare-ups hit surface quality." "Greenkeepers and turf managers have to be especially vigilant over the coming months, when weather conditions can be conducive to the activity of the Microdochium pathogen and the risk of disease can change overnight." He advocated that reducing the pathogen loading in the turf now gives a clean start that could help prevent damaging disease outbreaks. "Fungicide treatments with Medallion TL target pathogens in the thatch and on the plant, to reduce the disease pressure and slow development of infection. Combined with its ability to protect the plant from infection this action of Medallion TL on the spores is likely to be one of the main reasons for the exceptional long-lasting results from early season applications. "Furthermore, new research has shown that the uptake and movement of Medallion TL active from root to leaf. This movement of the active ingredient could further help protect from disease attack through the winter months." 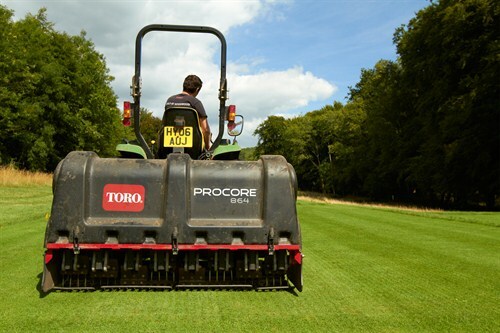 Application techniques should be aimed to ensure good penetration of thatch and into the base of turf plants, as well as coverage of the leaf, with Syngenta XC Turf Nozzles proving especially effective, he added. Dr Watson highlighted that the results can be enhanced with good Integrated Turf Management (ITM) practices. Removal of thatch, improving air flow and optimising drainage are all likely to create a dry environment that will be less condiscive to disease activity. "Leaf moisture is a primary precursor for Microdochium Patch development. Infection is more likely with falling autumn temperatures, but that is also associated with leaves staying wet for longer. 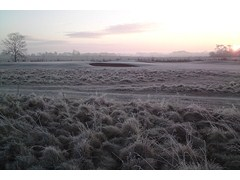 Swiching dew off greens and improving air flow will help to dry the leaves and reduce pressure," he advised. "Dry and cold conditions will lower the risk of infection." But possibly the greatest risk occurs when there is a prolonged blanket of snow cover. 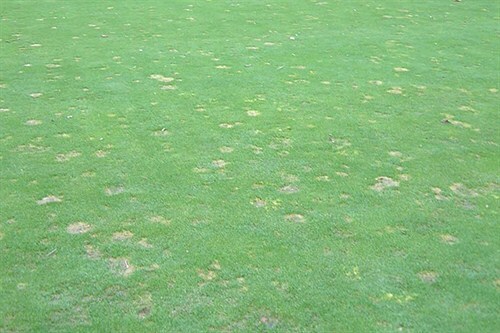 The snow insulates the turf surface from extreme cold conditions, and the leaf can remain permanently wet in this high humidity micro-climate, where Microdochium Patch, sometimes referred to as Snow Mould, can proliferate. 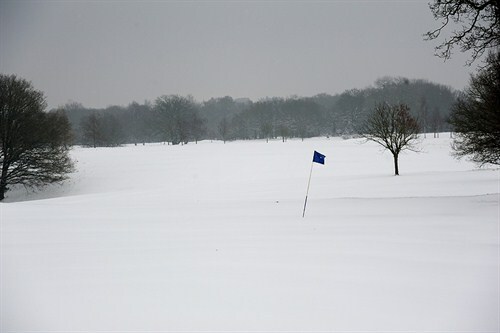 "When Medallion TL was first introduced, in greenkeepers' own trials greens treated before up to three weeks of almost permanent snow cover came out virtually disease free," recalled Dr Watson. "Untreated greens on the same courses were decimated by attacks." The inextricable link between wet weather and disease risk was highlighted last November, when GreenCast historic disease and weather charts recalled rainfall dried up in south east England in the middle of the month and the Microdochium Patch risk correspondingly fell to very low. But in the west of Scotland, over 75mm of rain fell in the same period and, with leaf surfaces almost permanently wet, the disease pressure remained exceptionally high throughout (below). "Management and fungicide timing would have needed to be adapted accordingly, to get the best results and the best value for money from inputs," said Dr Watson. 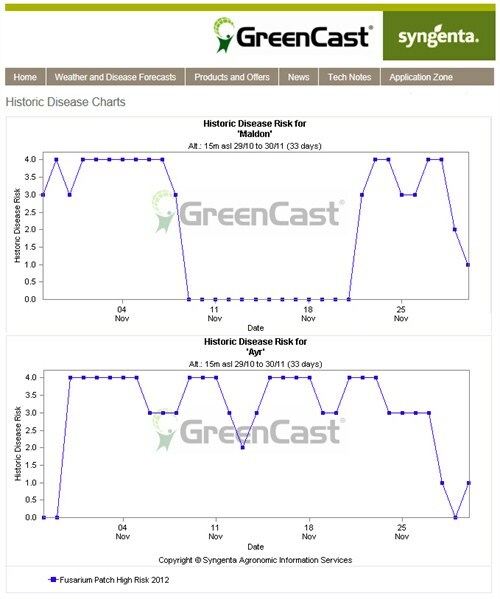 GreenCast weather and disease risk forecasts give essential early warning of disease risk and enable proactive application at the optimum time to prevent disease outbreaks, he added.